Vol. 1, no. 1 (December 21, 1881)-vol. 21, no. 27 (July 5, 1901). Description based on: Vol. 9, no. 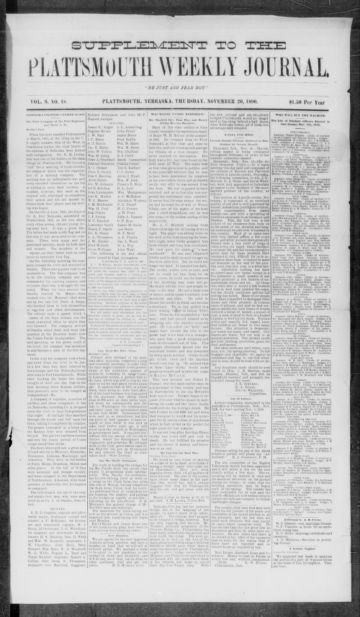 48 (November 20, 1890); title from masthead. Other editions. : Plattsmouth daily journal, Daily journal (Plattsmouth, Neb. ), Plattsmouth daily journal (Plattsmouth, Neb. : 1888), and: Daily journal (Plattsmouth, Neb. : 1898). Published in conjunction with: Murray weekly journal, <January>-May 1897.